Becki-Jo Allen had been living a quiet life in Liverpool, England, with her daughter, Indiana, but something was about to happen that would change their lives forever. When she started feeling nauseous, Becki-Jo suspected she might be pregnant. She went to the doctor to get checked out and, sure enough, she was pregnant…with triplets! “I had been being very sick and had a really bad headache so I booked an early scan and that was when I found out I was expecting triplets,” Becki-Jo said. “It was the biggest shock of my life! After the initial shock wore off, Becki-Jo and Indiana began to excitedly prepare for the triplets’ arrival. Becki-Jo hoped to make it full-term, but when she was just 31 weeks pregnant, she was rushed to the hospital with complications. There, she delivered her three sons via c-section. Because of their premature birth, all of the babies were very tiny. The smallest, Rocco, weighed just 3.3 pounds. His brothers, Roman and Rohan, weighed only slightly more. The boys spent six weeks in intensive care, but thankfully all of them proved to be fighters and soon they were able to go home. Whenever Becki-Jo went out in public with her family, people flocked to see the triplets. Strangers would approach them on the street and remark how similar the boys looked. Becki-Jo agreed – even she had trouble telling them apart sometimes! “We don’t get anywhere fast because people are always stopping us when we’re out and asking if they are identical,” the proud mama said. Eventually, though, curiosity got the better of her and she decided to take the boys in for a DNA test. When the results came back, both Becki-Jo and the doctors were stunned. The triplets were identical, the chances of which were only 1 in 200 million! The boys have continued to grow and thrive, and Becki-Jo loves her chaotic little family (even though her laundry has increased exponentially)! Just look at how they’ve grown! 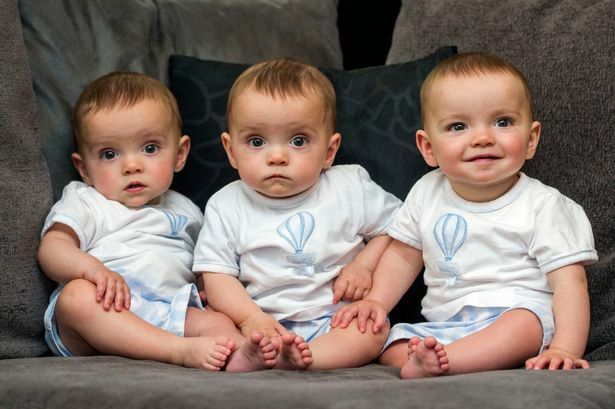 Were you amazed when you learned these precious triplets were identical? Then share it!